Description Photo 1229b appears to be a copy of this. Printed in green, and clipped from a government publication. Labeled, left to right: Mary Strachan, librarian, Pat Gray, Lois Twining, Pat Mitzel. 1954Caption: The Oswego Public Library, a branch of the Clackamas County Library, is located in the City Hall on A Avenue. 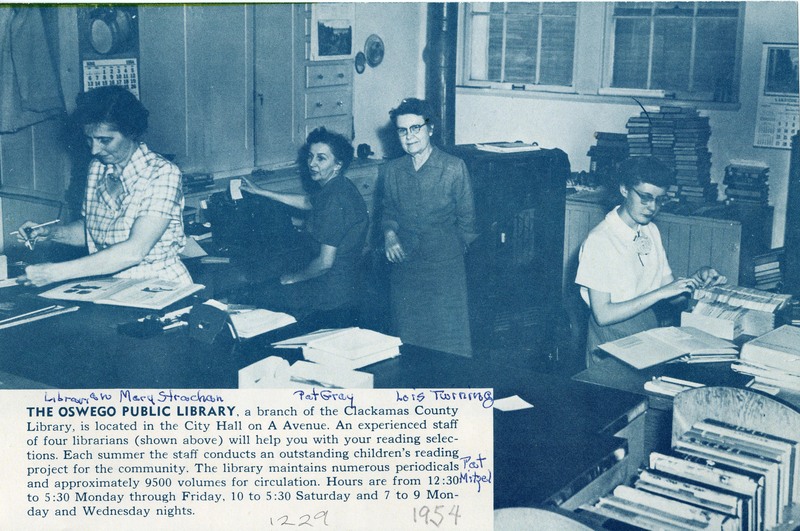 An experienced staff of four librarians (shown above) will help you with your reading selections. Each Summer the staff conducts an outstanding children's reading project for the community. The library maintains numerous periodicals and approximately 9500 volumes for circulation. Hours are from 12:30 to 5:30 Monday through Friday, 10 to 5:30 Saturday and 7 to 9 Monday and Wednesday nights.